Clearing out Wave 1, and after this is over I'll just have a few Rebel Wave 2 ships to go over. Let's take a look at a much maligned ship from Wave 1, the Assault Frigate Mk II. 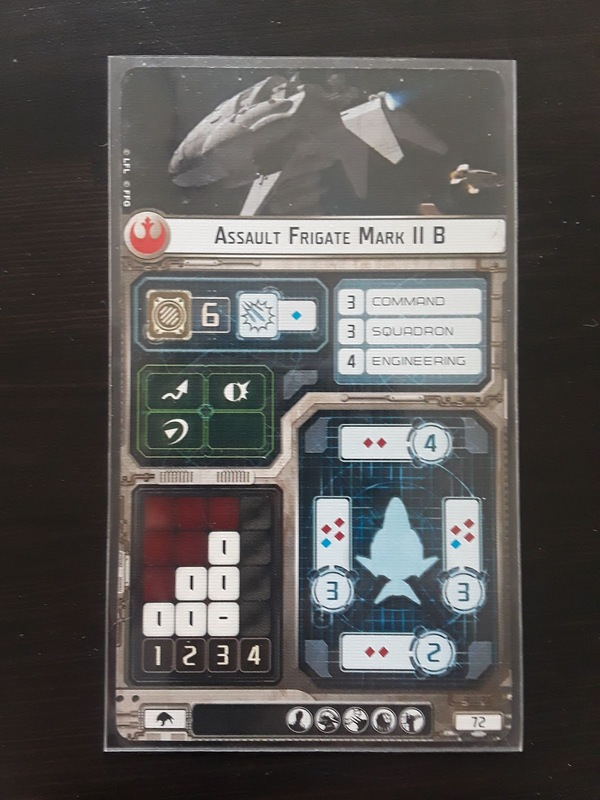 The Assault Frigate Mark II (AFII) was the largest ship the Rebels had access to in Wave 1, and was responsible for the Rebel success in the 2016 World Championship over the dreaded GenCon Special and brought 4 years of Rebel Fighter Supremacy over the Imperials at major tournaments. Well, that might be a bit of hyperbole, but for a while the AFII was the best Rebel answer to "what can push squadrons and still fly safely and hit moderately hard?" and was helped in this by some upgrades that really only it could take. The Assault Frigate today is still the only medium based Rebel ship, and puts itself into an uncomfortable middle spot cost-wise when compared to the Large base and more robust Small base ships. It's moderately more expensive than the robust Smalls, coming in at 72 and 81 for the B and A types respectively, while the Pelta Command (the closest analog to the B variant) is 60 and the MC30c Scout which isn't really a very close analog to the A variant comes in at 69 points. Meanwhile the MC80 Command (B variant analog) is 106, and the MC80 Assault (A variant) is 114. It's an unusual pick for this reason, as people just looking for a cheap squadron pusher will go with the similar squadron command cost of the Pelta Command, while people looking for more of a well rounded combat ship might be better served with the cheaper MC30c, or willing to shell out the points for the much more robust MC80 Assault. The AFII is okay, but not great, in a way that does not lend itself to list building at 400 points. But let's look at what you're getting for your 72 or 81 points. The AFII is reasonably well defended, with 6 hull, but 12 total shields including 4 front, 3 per side, and 2 in the rear. It has a Brace, Redirect, and Evade token, which is a pretty decent spread all things considered, and also sports a Defensive Retrofit upgrade slot, so Electronic Countermeasures or Early Warning System are on the table. 4 Engineering Value means that a dial can recover 2 shields, and a dial + token is worth 2 damage cards, putting it firmly in the "Combat Ship" level of damage recovery giving it parity with ISDs, VSDs, and MC80s, though the low hull means that by the time you are engineering away damage it may be too late already. For combat, you're looking at a pretty good 3 Red / 1 Blue out of the side arcs and either a double Red out of the front and rear (B variant) or 2 Red / 1 Blue from both (A variant). 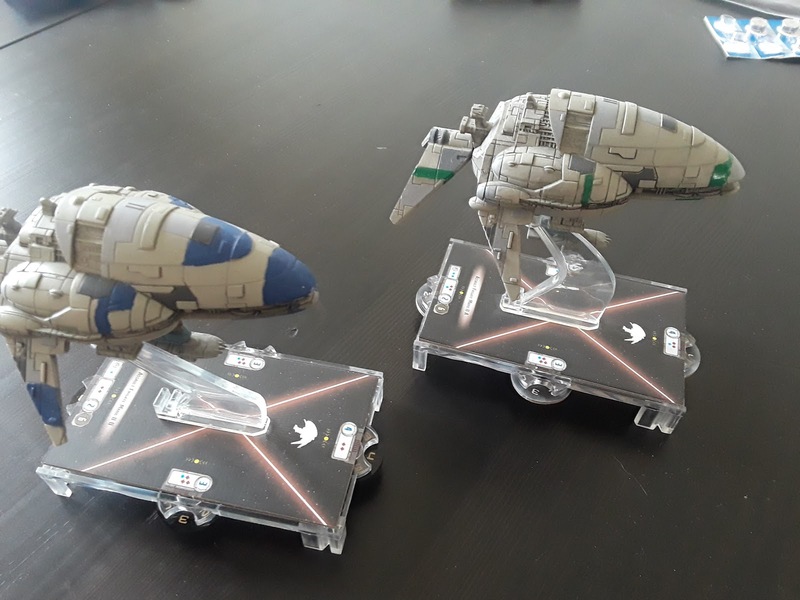 And while it is not always easy to conceptualize from the card, the cardboard has the arcs of the front / side in a very easy to line up position (and a position that makes getting away if you set up a double arc plausible) making this a very good double arc ship. In addition, being a broadside based ship giving the obvious synergy with Ackbar, it allows the ship to skirt the combat area, avoiding exposing itself to close range danger while still bringing it's best arc to bare. This duality (wanting to double arc to maximize damage, but also wanting to broadside to protect itself) does not lend itself to being an easy ship to understand or fly well. Both variants have Turbolasers and Weapon Team upgrades to add to their damage output. For squadron related things, the B variant is better at pushing squadrons around with 3 Squadron Value to the A's 2 Squadron Value. On the other hand, the A variant is much better at flak, with 2 Blue dice to the B's 1 Blue. Both have an Offensive Retrofit slot. 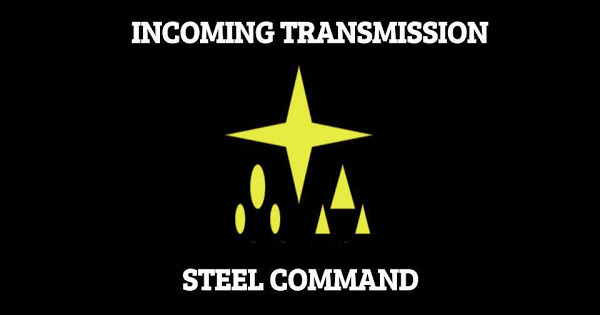 Finally, for command and movement, the ship has a 3 Command Value, making it no more responsive than a Large base ship, and a not particularly great I / I,I / -,I,I yaw pattern with a maximum speed of 3. So, what are the upgrades that this thing wants to use? Well, it comes with 2 possible titles, each one being more "for" each variant, though technically either one can equip either title. The AFII-A gets Paragon, a 5 point title that lets you add a single Black die to your attack pool if you've already attacked your opponent this round. In other words, it adds 1 die if you've double arc'd your opponent, though you can do things like use Concentrate Fire dials after the Black die is added to get more Black die. Meanwhile, the title Gallant Haven is an 8 point upgrade that lets you reduce damage to squadrons at Range 1 of you by 1. Unfortunately for the AFII, being able to use this to reduce an attack to 0 damage was removed by a FAQ, and moved Gallant Haven from being a very common sight in Rebel Aces lists to being almost completely absent, as it turned Gallant Haven from keeping a squadron with a Brace available from needing 3 damage total in an attack just to damage it into an upgrade that required a Brace squadron to need 3 damage done to it in a single attack to it just to reduce the damage at all. But what commanders can utilize an AFII? The most obvious is Ackbar, as a broadside based AFII can chuck upwards of 10 dice at long range from a side arc given the right upgrades, objective choice, and commands, or chuck 7 and 9 dice in two attacks with a different objective and upgrade selection. Honorable mentions are in no particular order: Sato, who can boost the damage of the AFIIB which is pretty good at pushing squadrons for him. Mon Mothma or Cracken, to give them something resembling a larger combat ship that can still benefit from their ability. And Garm Bel Iblis for being the cheapest way to get 3 tokens onto a ship. Yeah, none of those are exactly selling points, are they? Officers give you the option of Bail Organa being the only Medium ship, which is a bit uninspiring honestly. Better officer options are Lando if this is your biggest or most important ship, Skilled First Officer for slicer prevention, or Veteran Captain / Hondo Ohnaka for tokens on demand. Walex Blissex is another option, as the ship is just big enough to want to use it's Redirect (or Brace) multiple times in one turn, and still have shields to wish it had it back. Honorable mention to Flight Commander giving you an option to push squadrons further out ahead of you, especially if you're moving slow or want a different option than Boosted Comms. Intel Officer works pretty well if you're slinging some ungodly number of Ackbar dice, though the cost is something to consider. Weapons Teams are a fair question. Caitken and Shollan are almost made for the ship, fixing the very temperamental Red dice. Veteran Gunners are not quite as good but an option if you've already found a home for the twins. Gunnery Team is always an option, especially with Ackbar pushing double broadside shots. And for niche uses, this is the cheapest way the Rebels can reliably get Flight Controllers on multiple fighters at a time (ignoring Leia Pocket Carrier Hammerheads, as all sane people should). Also speaking of niche uses, Ordnance Experts can go on a Sato fueled Assault Frigate to maximize damage from his Black dice swaps, and Paragon's bonus. Offensive Retrofit could either be overlooked, or could be used to customize how you are using your AFII. Disposable Capacitors is the best for Ackbar, putting an extra Blue downrange for one (or two with Gunnery Team) attacks doesn't sound that impressive, but every little bit helps, and 3 points is a small price to pay for an extra die. Meanwhile for a squadron pushing AFII with Flight Controllers, Expanded Hanger Bays is practically required, giving you 5 squadrons boosted if you've got a token to spare. Boosted Comms meanwhile lets you push a smaller number of squadrons but back in Red Range, and pointed to loop around the fight. Wait... Weapons Teams and Offensive Retrofit? That's right, this is one of the few Rebel ships that can take Boarding Teams! Boarding Troopers and 3 Squadron Value is pretty good for exhausting out all the good tokens. Boarding Engineers is a bit situational. Cham Syndulla can work well to scramble out a squadron pusher or repairing tank for multiple turns, but with Thrawn around and popular he might not be the best pick. Jyn Erso might be better in a vacuum for locking out a key command for one turn, but even then with Thrawn the non-important command dial can be the one discarded. Basically until Thrawn and 2 ship Imperial goes away or Jyn gets some more objectives to play with, take Boarding Troopers or nothing here. Defensive Retrofits are pretty good to have natively on a medium size ship. Back in the Wave 1 days when XI7s didn't explicitly prevent you from redirecting more than just 1 total shield, Advanced Projector was the go-to for this ship, as you could splash 12 damage across the entire shield surface of the ship before taking any damage. As it is now, Electronic Countermeasures (ECM) or Early Warning Systems (EWS) are your preferred take here. EWS being better against large numbers of small attacks such as squadrons (keeping them off an unshielded arc, for example) or small ship swarms. ECM's being better against big attacks with likely accuracy results, to ensure you can spend your Brace. Reinforced Blast Doors (RBD) are another option, though with your shields it's unlikely you'll need to worry about hull damage to the point where RBD will save you for another round of shooting. Finally Turbolasers. This one can be a bit tricky, as it is 100% a declaration on what sort of AFII you are going to be flying. For the double arc / Paragon ship or Ackbar / Gunnery Team / Advanced Gunnery broadsider, Quad Battery Turrets are the best option. A bonus Blue die for just 5 points, at the cost of moving slowly. You can always jump up in speed after you take your shots if you need to escape! For a more reliable Ackbar / Gunnery Team, Enhanced Armament is expensive but an extra Red from your side arcs. Turbolaser Reroute Circuit is usable as well, if you're willing to give up your evade token or expecting to get all up into their business and don't expect to use it anyway. XI7's are an option as well, but really only if you're throwing Ackbar level of dice. Lastly, H-9s are an option as well if you feel the need to lock down a Brace or go flotilla hunting. Here's your Ackbar broadsider. 7 Dice out the side at 2 targets going faster than you, or 8 on one if you mix in a CF dial. The drawback is no real way to modify your dice once you roll them, you'll live and die by your fickle, fickle Reds. But if you do hit hard, Intel Officer will make sure that either it sticks, or the next one will. 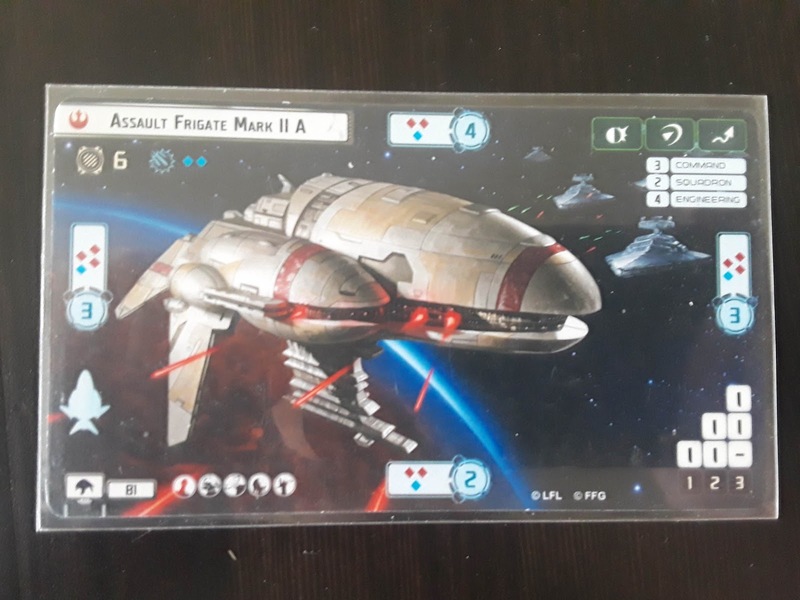 This is going to be a bit more robust of a squadron pusher than your Pelta, and with 5 squadrons for as many as 2 turns (you banked a squadron token turn 1, right?) you're going to be putting an extra 2.5 damage average out against enemy squadrons with your activation, or more if you're running some of the Rebel swarm squadrons, or have Toryn Farr. Cool. I guess you can add Gallant Haven for 8 points if you're not running Aces or Jan Ors? Maybe you just don't need as strong an activation, but still want something that can just lay out a some Red dice from outside the fight, and push a trio of squadrons around. Here's the B stripped down to the essentials. Maximum effect! Rush in and double arc the enemy, and unload your boarding troopers. 2 Squadron Value is honestly high enough to lock down the tokens you really need to (often just the Brace) and you've got 2 attacks to light them up with 4 dice each. Then the rest of your fleet can join in. That's it for the Assault Frigate. I guess that leaves the Wave 2 MCs, the MC80 Home One - Class Cruiser and the MC30c Frigate to get to next.